On a recent drive in Oakland's Montclair neighborhood, a motorist stopped at a stop sign and instantly found herself surrounded by wild turkeys. When the driver honked, the birds responded by pecking the car's tires and door. Minutes passed with the driver paralyzed until finally an intrepid resident emerged to shoo the big birds away. 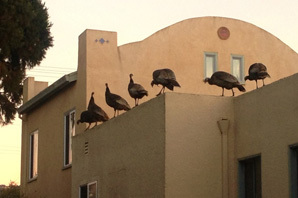 It was just another day in the Bay Area, where turkeys are growing steadily more bold. In Albany on Monday, residents went before the City Council to formulate a strategy for ridding themselves of about 30 of the wild birds roaming the city. But scientists say it may be too late to stop the the birds' encroachment into Bay Area suburbia. According to Scott Gardner, an environmental scientist with the Department of Fish and Wildlife, wild turkeys are becoming more common in California neighborhoods. He added turkey populations grow in suburban areas because food is abundant, especially because some people enjoy feeding them. The fowls were originally introduced into the state by the Gardner’s department in the early 20th century. Nearly 3,000 arrived California between 1959 and 1988 alone, according to a Fish and Wildlife document. Since then the state’s turkey population has ballooned to a quarter-million. But he acknowledged that they can tear up gardens, damage cars and steal food. A bicyclist died last year in Martinez when he collided into a flock of turkeys. The radio story of one particularly aggressive turkey. And turkeys sometimes charge the familiar faces of people who have fed them in the past, another reason not to feed them, Wilson said. So what should you do if attacked by a turkey? Getting a permit to kill turkeys in suburban areas is nearly impossible due to a variety of laws in most cities, such as those prohibiting the discharge of a firearm. Only eight bird abatement permits were given out last year, according to the Department of Fish and Wildlife. That doesn’t mean you’re helpless, said Susan Heckly, the wildlife rehabilitation director at Walnut Creek’s Lindsay Wildlife Museum. Turkeys tend to avoid flying short distances and fences are sometimes enough of a deterrent to keep them out of yards, Heckly said. They usually avoid homes with dogs. If they do get in your way, you can most often shoo them away if you’re aggressive about it. And, like the Wicked Witch of the West, turkeys dislike water. So if they refuse to budge, give them a good spraying. Finding them a new home, however, is difficult. Fish and Wildlife stopped relocating birds to secluded areas due to cost and logistics, Heckly said. So for now they’ll just continue to gobble up more space in Bay Area cities.